Hello reader! What We Learned is a weekly feature here at Hipsters of the Coast. The goal is to take some of the events and articles polluting the Magic world, strip out the chaff (tournament reports, game theory, economics) and give you our superior opinion. Complaints are encouraged. Is it really “Nice” if it allows my Black Vise to deal lethal damage? It’s the middle of December and that means the Holiday Season is in full swing. By now holiday music, most likely the theme song from the Peanuts Christmas Special, is following you everywhere you go, and your friends are constantly sending you videos of Christmas light displays set to dub-step. 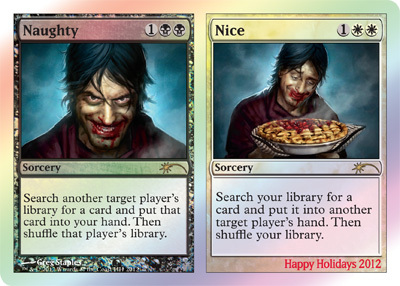 The Holidays are a time for reflecting on who’s been Naughty and who’s been Nice and Wizards has been through both sides of the spectrum this year. Ten official Magic products came out in 2012 and some were clear hits while others were not. So there you have it. Ten products released and we have an even score in the Naughty and Nice columns. I guess Wizards is getting Coal in their stockings, but also that sweet BMX bike they’ve been begging us for since we forgot about their birthday and got them that gift card to Old Navy. If you celebrate Chanukkah then you’re in the clear! If you celebrate Christmas then you’ll likely be spending this week making a mad dash to buy those last few gifts and get them shipped out only to find out that you have to pay a fortune for expedited shipping. Great round-up for the end of the year/world.